Steel triple screw motor vessel built by Schichau-Unterweser AG at Bremerhaven, (Yard No. 2280) West Germany in 1980 as a passenger and roll-on roll-off car and commercial vehicle ferry. Engined by Sulzer Bros. Ltd., Winterthur. propeller via a 2.36:1 ratio reduction gearbox. After all three identical sisters went into service each had their own distinguishing paintwork: Initially the “Spirit” had green bridge roof with white vents together with a green top to the lift housing on the starboard side, to the rear of the funnel. 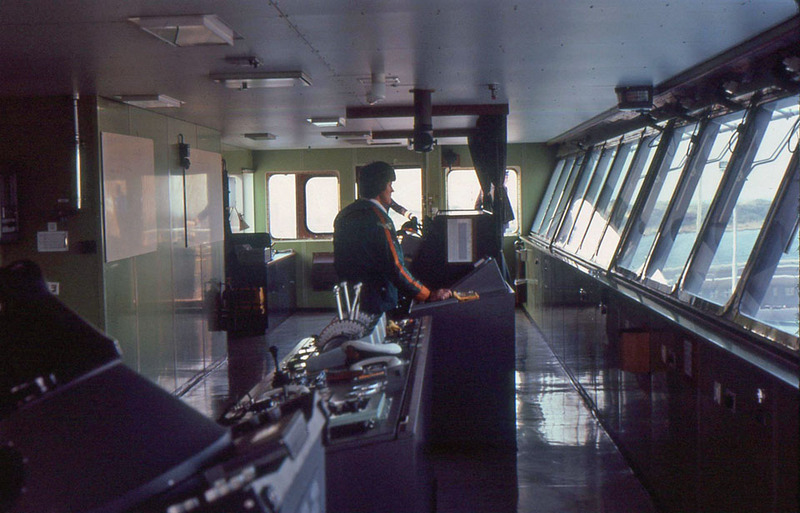 The “Pride” had an orange then green bridge roof with “Townsend” orange vents and orange lift housing, the “Herald” white bridge roof, vents, lift housing together with black surrounds to the bridge windows. 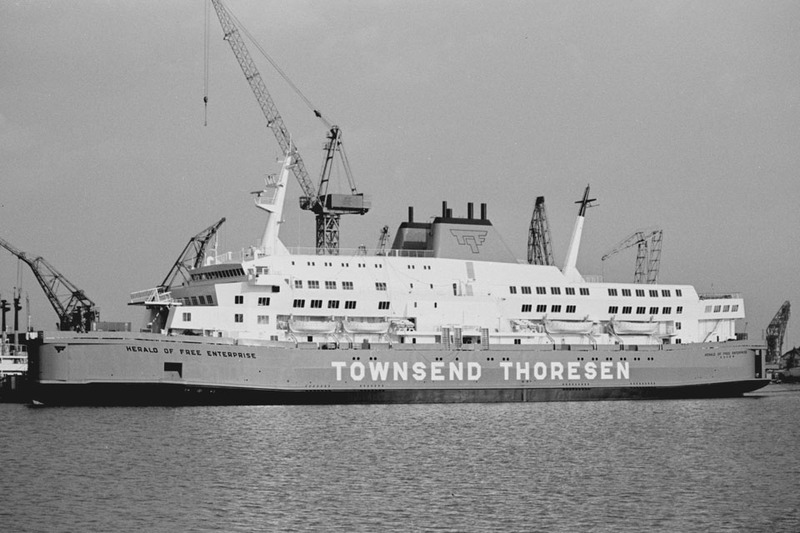 May 1980: Delivered to Townsend Car Ferries Ltd., Dover, England. 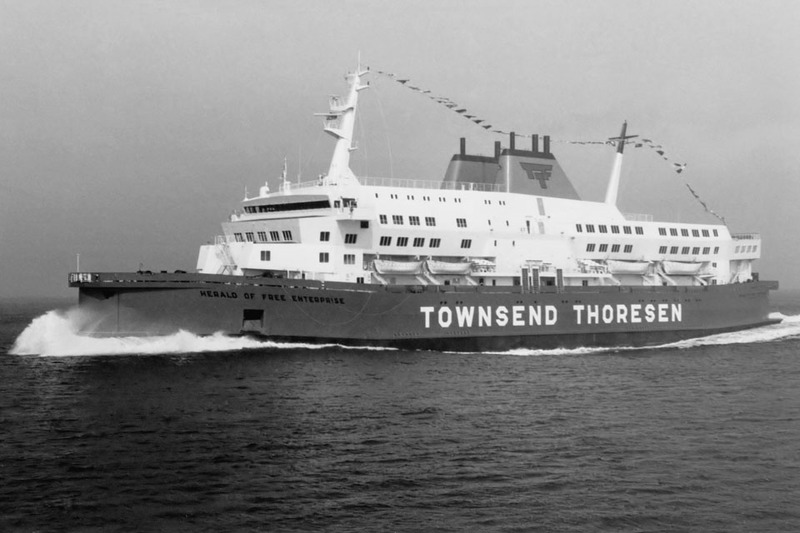 May 29th 1980: Commenced service between Dover – Calais, also Dover – Zeebrugge. January 31st 1983 – February 19th 1983: Paid an unexpected call to her builders at Bremerhaven having aggravated pier damage caused in early December (1982). No dry dock was necessary but plating on the starboard side was renewed and the deck plating behind straightened out. September 1983: Switched onto the route Dover – Zeebrugge deputising for the FREE ENTERPRISE VIII, herself away at an Amsterdam refit. “It was an unusual and interesting experience crossing to Zeebrugge in the “Herald” and although perhaps her accommodation is not really suited to the longer run to the Belgian port, at this time of year passenger loadings are usually light and the extra space availability to the passengers was a pleasant bonus. In spite of the few passengers and the longer crossing, the stewards busied themselves with cleaning and polishing and were justifiably proud of their ship. Down in the engine room, the engineers had closed the starboard engine down to renew the fuel injectors and but even running on two engines we managed the crossing in a very creditable four hours and eight minutes. The “Herald’s” senior master, Capt. 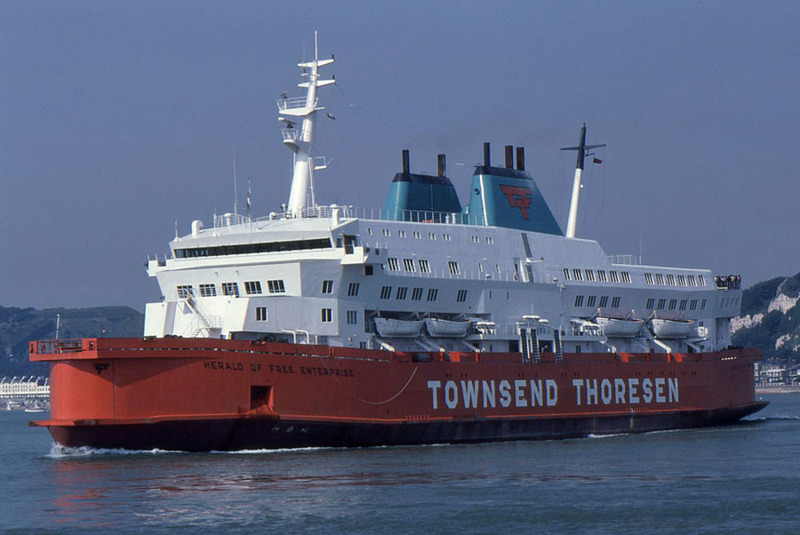 John Martin pointed out that this was one of the ways in which he felt the Townsend – Thoresen “Blue Riband” trio are superior to the Sealink vessels on the Dover – Calais route: in the event of engine trouble it was possible to shut one engine down and still keep to schedule……. The enthusiasm and pride of the captain were plainly evident —- he expects high standards from those around him and they readily respond by giving it. The “Herald” could not be faulted and even some 10 months after her last refit, she was in remarkably fine condition both inside and out. She was a delight to sail in.” (John Hendy, Sea Breezes Vol.58 No.457 January 1984). March 3rd 1985: Went for refit. November 8th 1986: Moved back to Dover – Calais, as cover. 1987: Switched to Dover – Zeebrugge. Also announced that she was due to have cabins fitted during her refit. February 1987: Announcement made that during her refit she would receive a new video lounge and cabins in the area of her present “B” Deck bar. 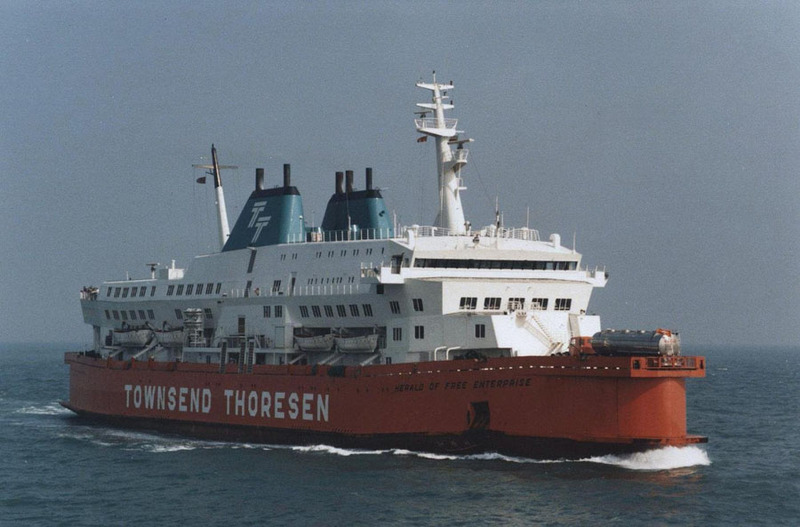 March 8th 1987: Verbal agreement between Townsend Thoresen and the Benelux joint venture for salvage. “After various consultations, the conclusion was reached that the vessel could best be lifted by the use of 32 ‘strong points’ affixed to the struts of the solid E-deck. It would be these that the ‘fist thick’ cables would be fastened for the actual lifting operation when the lifting tugs would be used. The cables would have to cast from the ‘strong points’ over the par buckle supports (which would operate like a crow bar and as a protection against the friction from the steel cables) to the pulleys on the lifting tugs. The par buckle supports, those great monstrosities of more than two metres in height, would be welded onto the strongest part of the boat. A steel bumper, which would act like a corset, would be wound about the ferry. 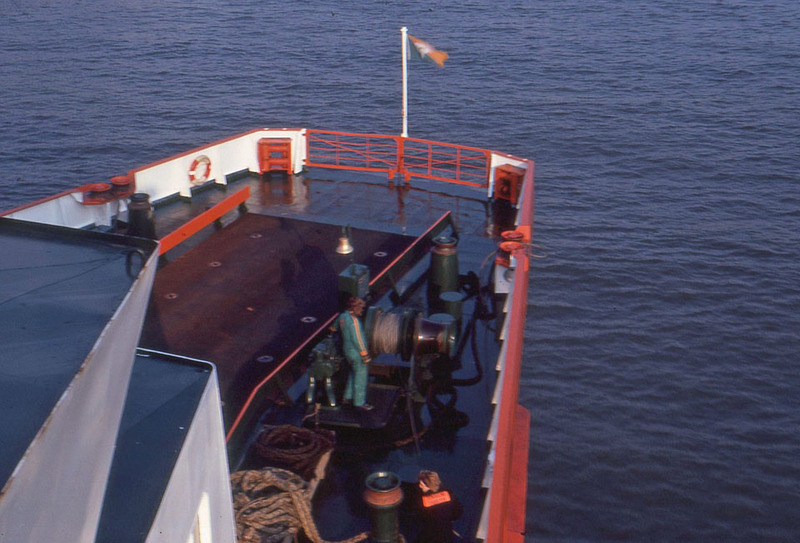 For extra lifting strength Smit-Tak kept two of its barges at the ready: both of which would be connected to the wreck by cables wrapped about the ferry and secured to its starboard side. This would guarantee extra power against any possible rolling motion”. 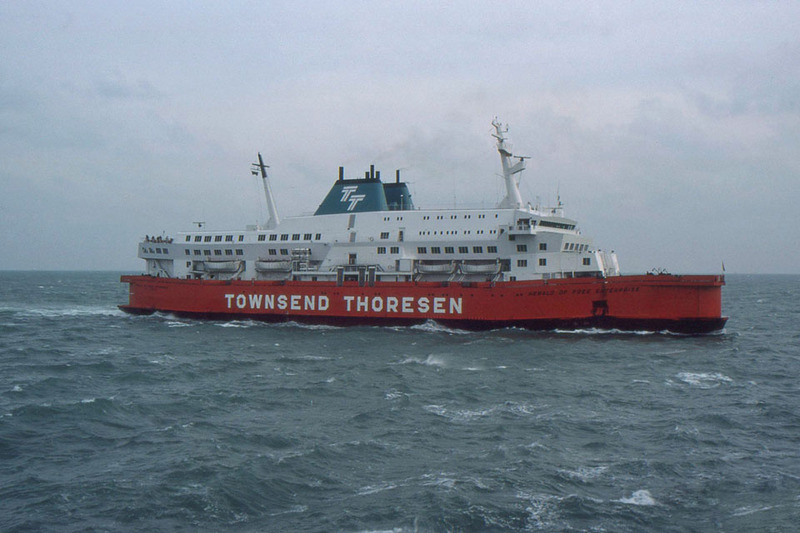 March 14th 1987: Contract signed between Townsend Thoresen and the consortium used for salvage (Smit-Tak, U.R.S. and the four firms of T.V.B. – also called Norma Ltd – Dredging International, Decloedt, De Nul and Herbosch – Kiere). April 7th 1987: Vessel eventually raised by Dutch salvage company Smit-Tak. 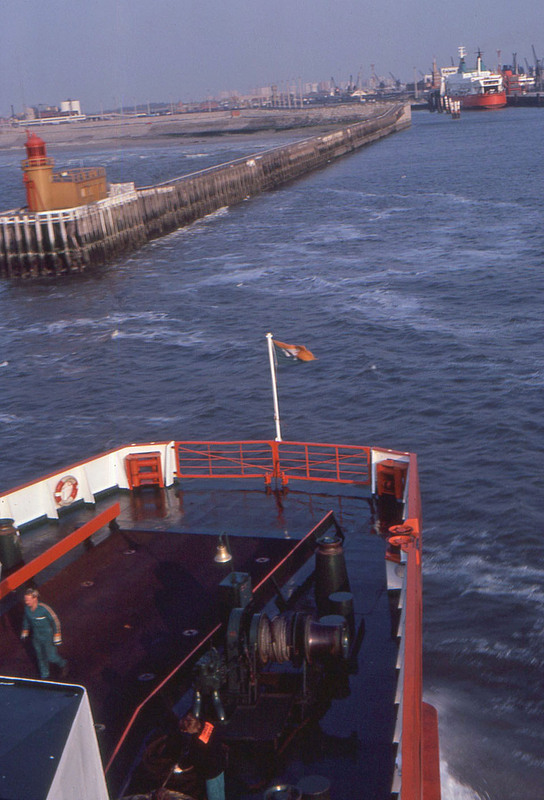 April 24th 1987: Towed to Zeebrugge. 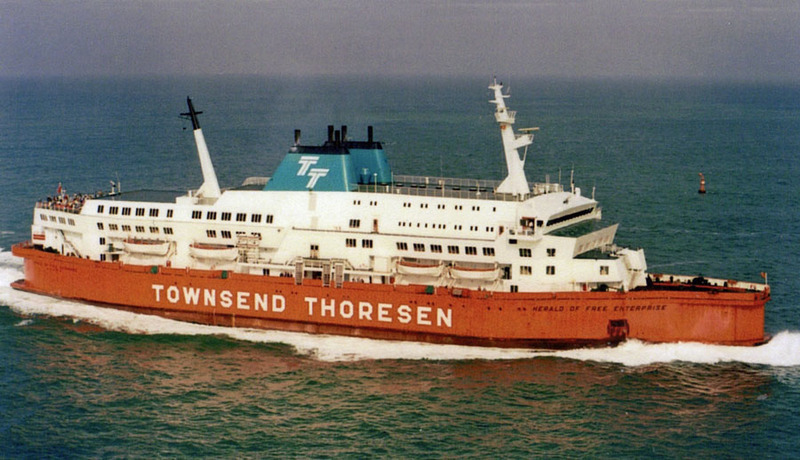 May 14th 1987: Towed to De Schelde yard, Vlissingen, Holland. Declared a total loss. September 30th 1987: Sold to Compania Naviera S.A. Kingstown, Saint Vincent. Renamed FLUSHING RANGE. October 5th 1987: Left Flushing towed by the tug MARKUSTURM. 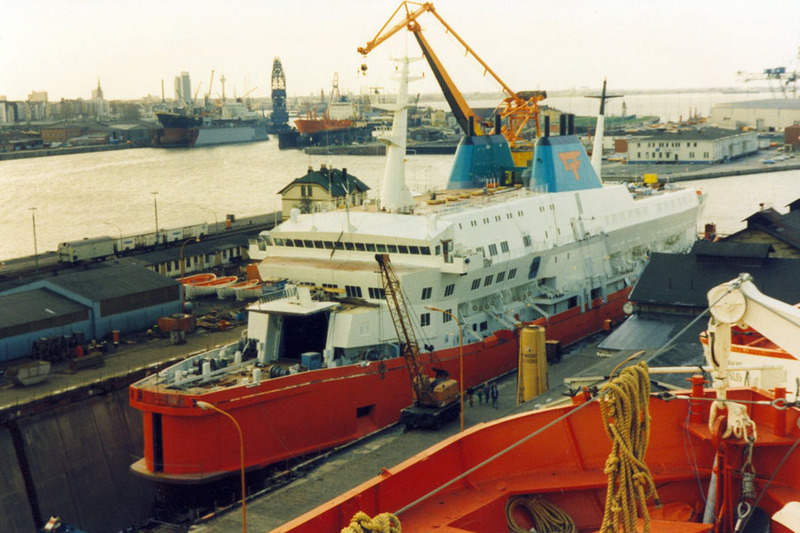 Then joined forces with the GAELIC FERRY which has been laid-up at Zeebrugge since April, 1986, after being used as a dumb barge to carry obsolete link-spans from Southampton to the Belgian port where the plan was that they would be used in the construction of a new double-decker berth. P & O obviously had other ideas as the Southampton link-spans never left the ship and continued on their way to the Far East. 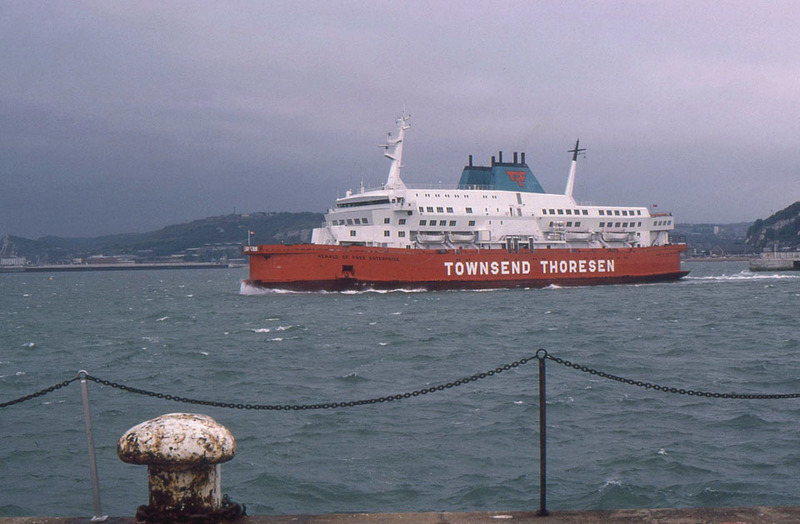 October 1987: According to the Daily Mirror, whose issue carried exclusive photographs of the FLUSHING RANGE passing Beach Head, the tug captain was under orders to pass through the Straits off Dover during the night so as not to risk being seen. October 16/17th 1987: The English Channel was lashed by hurricane force winds. The two ships broke loose and were “lost” for at least 24 hours until they were spotted by a French coastguard aircraft near Cape Finnisterre. October 19th 1987: They were drifting off the Spanish port of Gijon. Tow re-established and journey continued. December 27th 1987: Having broken free again, the vessels were sighted at position 34.46°S, 24.39°E near to Port Elizabeth, South Africa. January 2nd 1988: Towed into Port Elizabeth, South Africa. March 22nd 1988: The vessel eventually arrived at Kaohsiung , Taiwan for breaking. We would like to thank: Gary Davies, Brian Fisher, Ken Larwood, Jurgen Stein, Andreas Wörteler and Iain Yardley for their assistance in producing this feature. All information is believed to be correct and no responsibility is accepted for errors and omissions. Special thanks go to John F Hendy. Was the February 1987 refit a definite? I always believed that the HOFE was on its last voyage before going for refit. This is very important. I checked with my source and indeed you are correct. Thanks for pointing this out and,as is my aim,making all information correct. Phew! Thanks Nigel. I’m drawing up 3D plans for my new book “The Zeebrugge Legacy: The Story Of The Herald Of Free Enterprise” and I’ve just done the B-deck bar so when I read it had been replaced by a video lounge and cabins I thought I would have to get my eraser out! Survivors talk of being in the TV/video lounge but as this is not marked on any plans anywhere, I have to conclude that it was a normal lounge given over to cartoons being shown on television screens somewhere. 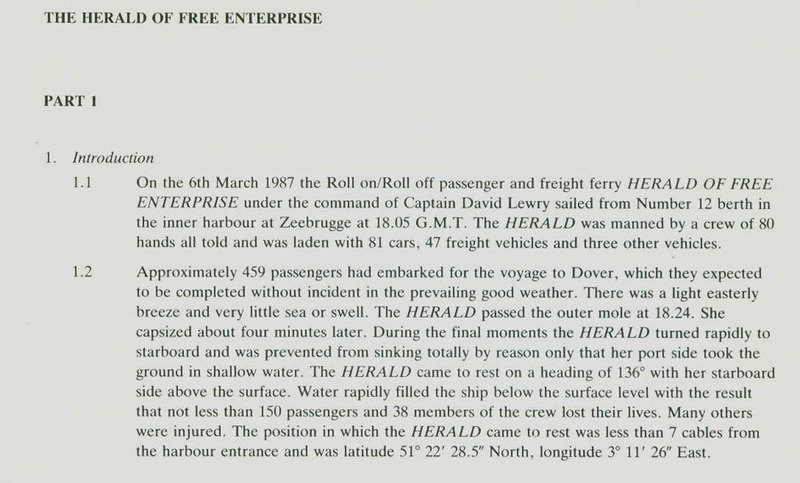 I’m not really convinced that the time is yet right to consider publishing a book about the ‘Herald’ which is still so fresh in the memory and the continuing cause of much pain and anguish to many living in and around the port of Dover. It’s certainly a topic that, as a writer, I personally would wish to steer well clear of. Evening John. I appreciate your comments about the timing of this book but have to disagree as the people I have already spoken to (passengers, relatives and crew members) believe this book is long overdue. It is not intended to be sensationalist but more of a tribute to everyone who was involved. I wouldn’t be writing it otherwise and anyone who I have approached and has not responded or have categorically said no won’t be bothered by me again. The book is already on Amazon, which I didn’t know about, put there by the publisher, but there is still a lot of work to do. Are good plans available of the external design of the ship showing attachments and hardware good enough to build a model from? Or a CAD drawing to produce a 3D printed model? I think now is the time to at least consider producing a good book and a more prominent memorial model while many of those are still around and able to contribute and comment on it. Hello Iain, my dad, David Saxby, died on the Herald. I was 15 and meant to go with him but couldn’t as I had important exams to do. I am very much looking forward to reading your book and seeing what you have to say. At university, one of my modules was Confessional Writing & Autobiography: I wrote about my experience (this was in 1997). I am married with two sons, the oldest being called David after my dad. Should you wish to contact me, feel free at calvsaxby@aol.com. Best wishes, Calvin. Didn’t see the tick boxes below. Apologies. Interesting information, thank you. Having read the official report and various documents relating I’m curious, just what happened involving deck officer cadets when she rolled over, was one of them supposed to have closed the doors? That Captain Miller on the Spirit of Britian knew of something and this coloured his views of cadets in general seemed strange, was he a Cadet or junior officer on the Herald? Is it true that the HOFE is still sailing, under a different name – and was never actually scrapped? The Herald was most definitely scrapped in Taiwan in 1988. With such a large number of fatalities on board and her significant damage deemed her a total loss. 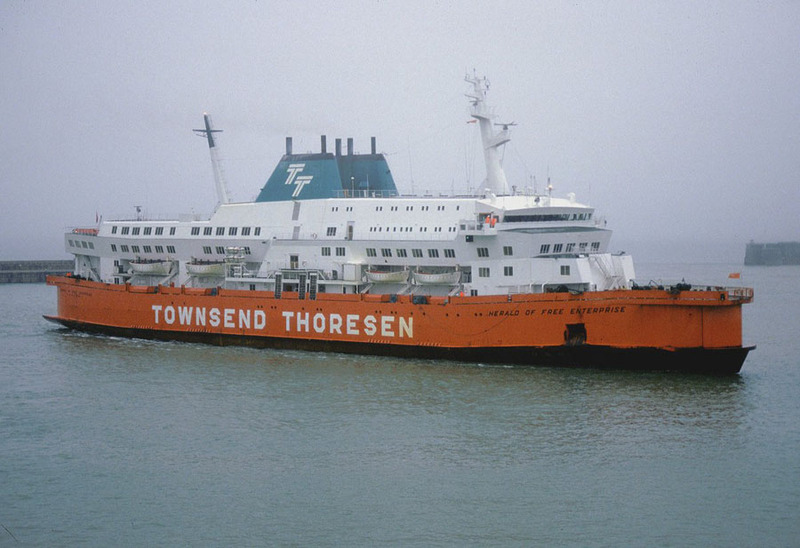 Unlike today where images exist of familiar ferries being beached and scrapped – I believe that no photographic evidence exists of the Herald’s scrapping under the name Flushing Range.